SWEET RETURN II is one of the newest of the Mark Ellis/Bruckmann 50s to come available on the brokerage market, and is the only Bruckmann 50 MKII presently available. Further, she has been kept in a fashion that the terminology “Like New!” feels appropriate. SWEET RETURN II is one of those rare offerings where, if you like her as she described on paper, you are destined to love her in person. Being the Mark II version of these unique and special sailing motorsailers, she shares all of the acclaimed attributes of earlier sisters, but offers added speed under power, compliments of her 200 hp John Deere and elongated hull form, which incorporates the swim platform. 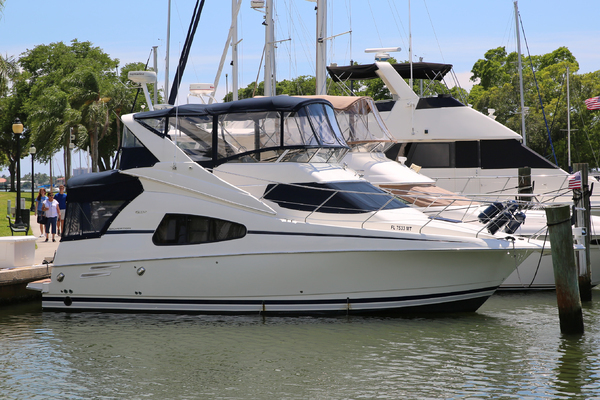 United Yacht Sales New Jersey would love to guide you through a personal showing of this 50' Bruckmann 50 Mkii 2008. This yacht for sale is located in Returning soon to Harpswell, Maine and priced at $695,000. For a showing please contact us by filling out the form on this page and we will get back to you shortly! Three steps lead to the pilothouse, which offers a 360° panoramic view, even from a seated position. The helm chair is an electric up/down model in Camel Ultrasuede. The inside steering station (hydraulic) is fully functional, complete with custom built-in electronics, chart table and engine controls. Navigating in adverse weather conditions is done in complete comfort and security. A custom chair with reading light is located behind the inside helm station on the starboard side. Opposite there is a U-shaped dinette, again upholstered in Camel Ultrasuede, which converts to a double berth. There are mahogany Oceanair mini-blinds throughout. Two large floorboard hatches along the centerline offer extraordinary access to the full-beam engine room below. Access to the cockpit is via a sliding door, which, when opened, creates a (single-level) large and inviting indoor/outdoor entertaining space. A fixed, mounted teak cockpit table with folding leaves and cooler box provides additional dining space and storage for beverages. A Teak Decking System sole was installed in the cockpit in 2015, and there is a hinged transom door for ease of access to the teak-decked swim platform.